Perinatal medicine encompasses various current topics in fetal diagnosis and management, besides preconception counseling. The concept of preconception counseling and healthcare evaluation optimizes a couple’s readiness for childbearing. This helps to minimize any foreseeable adverse factors through a careful diagnostic review and provision of appropriate intervention and therapy in advance. This has been dealt with in detail. 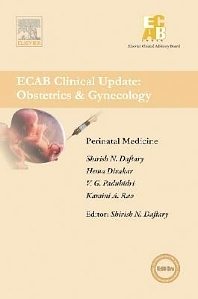 The section on etiology and management aspects of Intrauterine Growth Retardation (IUGR) covers investigation and management of suspected or known fetal abnormalities, placental failure, and fetal growth retardation. Prenatal diagnostic procedures had limited access and safety so far, but this is a thing of the past today, especially after the advent of real-time ultrasonography. It brings an increasingly clearer visualization of the intrauterine space and has vastly broadened the scope for fetal diagnosis and treatment. The currently available ultrasound-guided procedures for fetal diagnosis and therapy are discussed at length in the chapter invasive ultrasound procedures. The discussed invasive ultrasound procedures include amniocentesis, cordocentesis, and chorionic villus sampling, done to detect neural tube defects, fetal lung maturity, and chromosomal abnormalities. The controversies surrounding the evaluation of fetal anomalies by ultrasound procedures are covered at length which we expect would be of special interest to the readers. Opinions abound as well as differ on the interpretation of the findings and counseling of couples, based on the same. This section focuses on the implications of missed fetal anomalies in this background and its impact on pregnancy outcome. Evaluating Fetal Anomalies by Ultrasound: Where Do We Go Wrong?